In a move to further combat water consumption during a serious drought, lawmakers passed an ordinance last month that limits the size of a living lawn permitted for new home construction. We’ve been warned. If you’re thinking that this new lawn restriction doesn’t apply to you, it just might… eventually. The Model Water Efficient Landscape Ordinance states that new homes can only have lawns that do not exceed 25% of the total front, back and side yard square footage. This restriction is expected to reduce a home’s expected water use by 20% or 12,000 gallons per year. This ordinance will not apply if the lawn is irrigated with grey water, which is recycled water from household use. Before you breathe a sigh of relief that your home isn’t impacted, consider this. If you need to remodel your existing home’s landscape or plan to demo a fixer-upper, these new rules will likely apply to you. Lawn Replacement: Is Now the Time? Proactive homeowners are replacing their lawns whether they’re impacted by the ordinance or not. In May, the Metropolitan Water District of Southern California (MWD) launched what is considered the nation’s largest turf removal and water conservation program with nearly a half billion dollars. The message is clear… living lawns have to go and the sooner, the better. The goal is to reward homeowners for removing turf during the current drought, but like many rebate programs, the offer is good until the funds run out (and they do). CNN states that some homeowners are receiving up to $6000 for sod removal in the front and backyard. That’s a lot of money. It is worth doing the math to see if current economics alone are a reason to decrease the size of your lawn or eliminate it all together. An expert can help you decide. 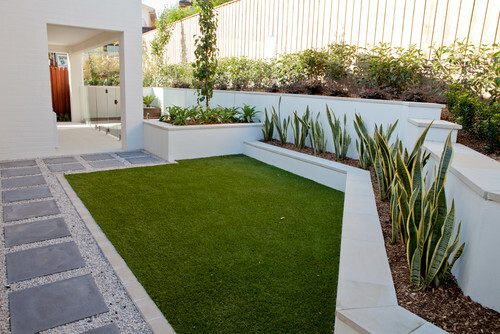 If you want the green without the maintenance, artificial grass is your answer. It’s safe for kids and pets (we install artificial grass without crumb rubber) while requiring very little overall maintenance other than keeping it clean—which is a fairly infrequent task relative to a weekly mow by you or the gardener. Speaking of sod upkeep, not only can you ditch that weekly mow, water bills should decrease because artificial grass doesn’t need irrigation. And, you won’t need to weed or fertilize it. There is no need to worry about artificial grass looking fake. It’s possible to choose an artificial grass type to match what is native to your area that will have similar-looking thatch (organic layer of dead and living shoots and roots) that sod has. More and more homeowners are opting for small patches of green that are often referred to as gem lawns. Not only do they add a pop of color to an outdoor living space, but they provide a soft area for kids and pets to play or relax on. If your gem lawn is made from sod, give it a practical shape that low-flow sprinklers can reach without waste. Odd shapes are difficult to irrigate and mow efficiently. The gem lawn above is artificial grass which could be your best option as it also eliminates rolling out the mower to maintain something this small. If your needs require replacing the lawn with a water-wise groundcover, there are a number of options to consider. The upside is that they’ll require much less water than sod will and they won’t need mowing. However, they will require occasional fertilizing and it’s important to keep weeds at bay. But, a variety of low-growing California native plants will do the trick and provide pops of color, if desired. Low-growing ceanothus offers blue-purple flowers that are attractive to butterflies and bees. A variety of flowering sedums offer the same impact. The difference is that water is stored in the fleshy leaves of sedum plants—a member of the succulent family—so they aren’t able to be stepped on like other succulents. In the event you do need to walk on the groundcover, dymondia (often called silver carpet) is a good option with its silver-green leaves and seasonal yellow flowers. Simply put, decorative rock is in. 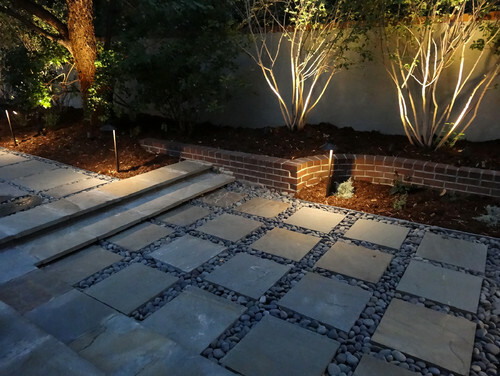 Regardless of whether it’s a bare patch of soil you need to cover or a full implementation of a minimalist or water-wise design, there are so many ways to easily incorporate it. Rock comes in a variety of colors, shapes and sizes but Mexican beach pebbles are particularly popular in Southern California. They come in shades of black, blue and grey but are best used in contrast to succulents. Deep green succulents like many agaves look stunning when planted against these rocks. 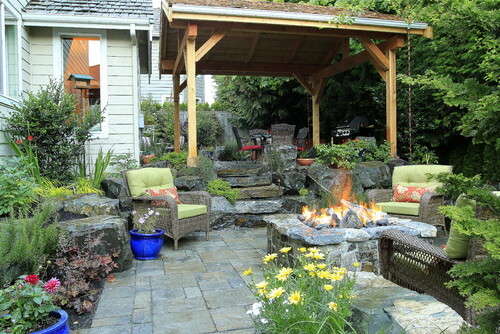 Or, simply place them amid decorative concrete or paver squares as the homeowner above did. Decreasing lawn size and utilizing water-wise practices inside and outside the home will certainly have more homeowners installing larger patios, walkways and other outdoor living spaces in lieu of lawns. The upshot is that this can result in the addition of outdoor kitchens, dining areas and lounge spaces which can be a win-win situation if you think about the potential for awesome outdoor entertaining. These spaces are also likely to increase your home’s overall value, too. Concrete pavers are usually a cost-effective and easy way to add or replace hardscape as they come in a variety of colors and styles. Typically set on a bed of sand and compacted gravel, they won’t crack like concrete slab and (also unlike concrete) are easy to pop out and replace in the event of an epic stain. Are you considering replacing your lawn with artificial turf or pavers? If so, we can help.